COOKING INSTRUCTIONS: Place skillet on medium heat and pour contents of pouch into skillet. Stir gently to prevent meal from sticking. Continue stirring until skillet meal is done in five to six minutes. Remove from heat and serve. 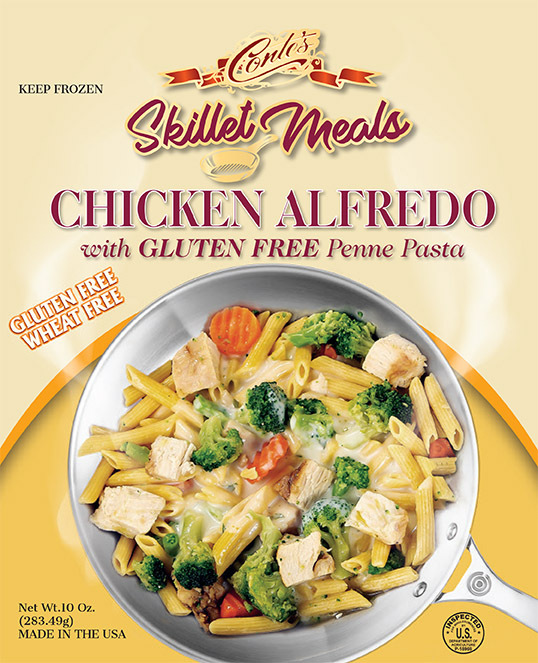 GLUTEN FREE PENNE (DEGERMED CORN FLOUR, WATER), PASTEURIZED WHOLE MILK, COOKED CHICKEN BREAST, BROCCOLI FLORETS, WATER, CHICKEN BROTH (CHICKEN MEAT INCLUDING CHICKEN JUICES, SALT, POTATO FLOUR, FLAVOURING, CARROT POWDER AND TURMERIC), CARROTS, ROMANO CHEESE (PASTEURIZED SHEEP’S MILK, RENNET, BACTERIAL CULTURE, SALT) BUTTER, PARMESAN CHEESE (PASTEURIZED MILK, CULTURES, SALT, ENZYMES) CORNSTARCH, ROMANO PASTE (ROMANO CHEESE [PASTEURIZED MILK, CHEESE CULTURES, SALT, ENZYMES]), PARMESAN CHEESE PASTE (PARMESAN CHEESE [PASTEURIZED MILK, CHEESE CULTURES, SALT, ENZYMES], WATER, SODIUM PHOSPHATE, ENZYMES), SALT, PARSLEY, BLACK PEPPER.